I have another question. When I generally render in 3Delight I use these "render settings" for different qualities that somebody made for DAZ 4.5. 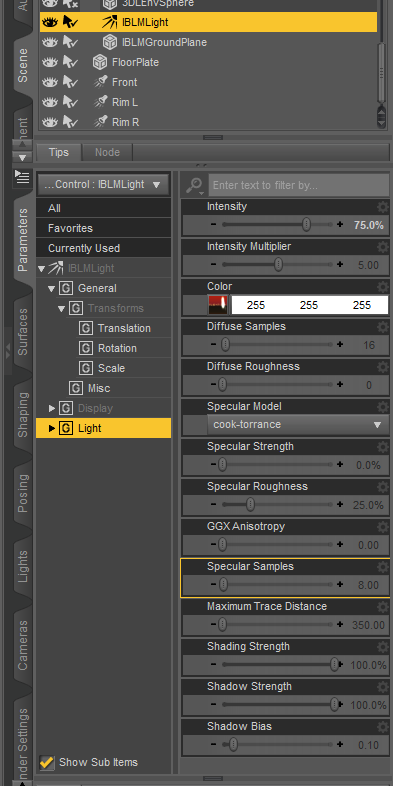 Other than changing the Gamma Correction to 2.2, which mine keeps showing as 2.20 no matter what I do....do I need to mess with any of the other settings for a high quality render when using this product? Or is that something IBL Master takes care for you and why it is so fast? If I want, *can* I tweak the render settings in 3Delight? I think the issues I was having before was because I was using the product BEFORE the update came though. I updated it and it seems OK for now. I'm working on a picture right now. We'll see how it goes to see if my issue with the sun is fixed. I guess my main problem was I wasn't sure WHAT to rotate. 2.2 is the same as 2.20 so don't worry, that is correct. Good questions about render quality! Thank you for asking them (others please take note): IBL Master doesn't make any changes to Render Settings for 3Delight. However, as an experiment you may or may not experience speed improvements by turning on Progressive Rendering. It can help get rid of occlusion artifacts. But more commonly you may see a bit of noise with the default light settings for IBLM Light. With IBLMLIght selected in the Scene tab (visible under IBL Master Control if you expand it), navigate to Light on either the Parameters tab or the Lights tab. You should then see a property (slider) called Diffuse Samples (default number is 16). Setting the value higher (try something like 32 first) will eliminate the noise at the price of some speed (see image below). 3delight has been this fast. Most of us just didn't know. The IBLM Light is faster than our older IBL shaders in DS because it uses newer functions and because it has a work around that makes it ignore the glitch that causes extraneous rays to multiply exponentially with transmapped surfaces (sorry I know, it makes my brain hurt just to write it ). Just noted your last comment about '3delight has always been this fast', but to be honest until now, I/we have never seen that, for the reasons you mention. I remember reading many times here on the forums that people felt we somehow had an inferior release of 3delight in Daz Studio, and I would see amazing realistic 3delight renders on the Internet, which I couldn't repeat. So for realism I had no problem ditching 3delight for Iray. I now feel, for me, IBL Master has put 3delight back in the running. My 3dl renders are faster, it breezes through transmapped surfaces, and the resulting renders are resembling the realism of Iray, AND my computer is an ancient 'gas model' iMac! So those with newer models must be seeing even more amazing results. I must admit I never came to fully grasp the technical side of 3delight as much as I have Iray, but IBL Master looks as though, for me, that is about to change. I hope this will inspire some PA's to look at producing new 3delight products, or be more willing now to include 3delight shaders with their products. I certainly will now be buying 3delight products. I personally feel IBL Master has become a game changer, and at the moment it's top of the Daz 'What's Hot' list, so I guess a lot of other artists feel the same. Very well said and very kind. Thank you, Musicplayer. @hacsart: Very nice comparisons, thank you. DT is a master at his craft! "Your new IBL light product looks great. I use a laptop with windows 10 8 MB of ram, and a quad core processor. I am away from home so cannot give you more specs, but I can say that a 3DL render with uberenvironment and hair will usually take a half hour to render. if I use Area LIghts which I usually prefer since the specular is better, it takes a bit longer. Q: if I use the 3DL with your new IBL do the figures and props have to be prepped with 3dl shaders or iray shaders?" A: If you are using the 3DL side of IBL Master, you should use 3DL surface shaders for your figures and props. Q: "Does your IBL lighting create more burden on the system? (It sounds like it is the same or less--i.e.,if the render time is less, then presumably the system is not being killed. My issue with iray is that I must use cpu and it can take HOURS to get a decent render, unless it is just a portrait)". A: If you were doing 3DL renders using Uber Environment as an IBL before and surfaces with transparency maps, then IBL Master will be less taxing on the system because there are less calculations. IBL light does require more resources than regular lights however, and can take longer as a result. Q: "Can you use ANY hdri or only ones that are presets for DS? I have a bunch I have used in carrara or in Bryce, and I can use them in iray but they do not always create good backgrounds. IN fact, some of the ones for carrara do not have clear images, but they create nice renders in terms of the light)". A: Any HDRI will work. 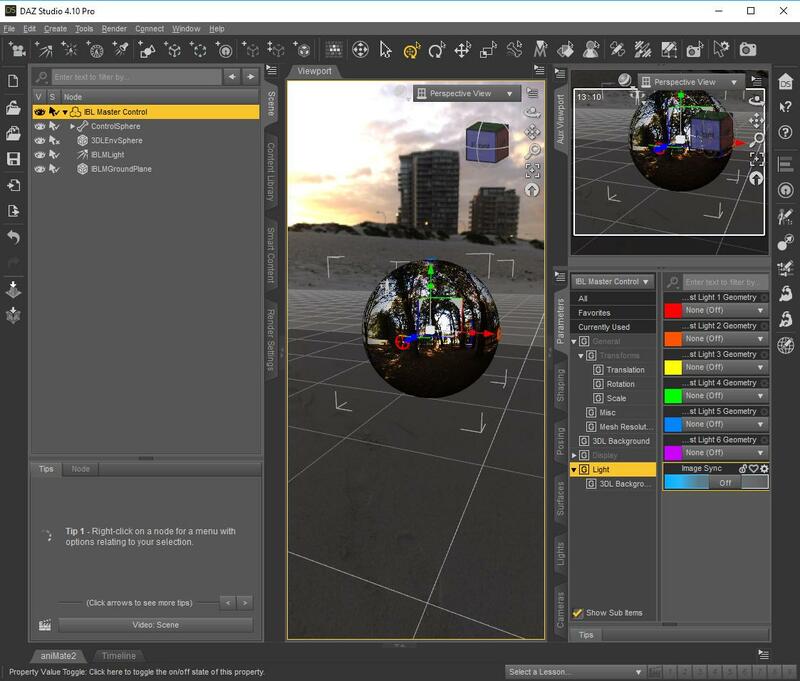 Using the HDRI as a background is optional, and on the 3Delight side, you can disable image syncing, so you can use a different equrectangular image (HDRI, TIF, JPEG, etc.) for the background than for the IBL. You just have to change the image on the background sphere last. On the boost lights - can you adjust the intensity and shadow options ? That would be most useful, I think..
Hi. I'm having another question. I went to the HDRIHaven site and it's full of nice HDRIs. I can load them and they render really nice in IRAY. It doesn't like the 3Delight and I think I read that this was OK? Anyway, my question is the HDRI I get from the HDRIHaven site are not rendering a background image if I put it in IRAY render mode. Is it supposed to be just the light or is the image also supposed to render? Is there a difference between say a set I get here on DAZ and these HDRIs? The lights are nice, I just sometimes need a sky and I'm a bit confused why it would not render the picture if it loads in the preview pane. Am I supposed to also download a picture? Did I miss something? I'm browsing to the HDRI file and getting it attached just fine. The lights render great, but just no image seems to be rendering. Ah! That draw dome thing was the problem as mine was off. Yay! Thank you. That's usually the first setting I change when doing an Iray render, unless I have a particular reason to do otherwise. To Parris: bought it and love how I can at least now see the image in the viewport when setting up an Iray render; have not done anything else, as I was away from home for a while this afternoon and have other things planned for the rest of the holiday. Will comment more later. I am really starting to get the hang of this tool. I have found it most valuable. Now, my only other question has to do with what I perceive as fuzziness and you'll have to forgive me if this all sounds very basic. I have circled some parts of the shadows that just do not looked finished. I had this problem with regular old HDRI and 3Delight for YEARS, but no one has been able to tell me how to fix it or what causes it. Which bums me out b/c I REALLY love HDRI...I always have but sometimes I get these weird artifact looking areas for lack of better words. These examples are all IRAY renders. The thing I find the most interesting is that the one where the girl is casting in front of the fence with no wall took only 5 minutes. But the same light and everything with the wall behind her seemed to render for over 40 minutes....I actually cancelled it, but it was a much better render. The only difference was the picture with the wall is the one where I was asking about the HDRI backgrounds not showing. I actually had the dome off on the one with the wall. The one with the sky is the dome on with an HDRI from that one website. Is that normal as far as speed? Do I need to up my iterations on the one that took 5 minutes to get a better look? Why did the one stop while the other one didn't? Any idea? I know I didn't mess with the settings LOL! I haven't actually changed anything in the IRAY settings...so they are probably all set at the default section when 4.10 was installed. I literally abandoned trying IRAY when Terra Dome 3 came out and my system kept crashing. Turns out it was a bug that they fixed, but I was hesitant to go back to it. I've only tried it a few times with poor results since then. So, whatever I learned about IRAY is long gone from my brain and I'm sure the system has improved since then! The warrior with the circles took about 20 minutes to render and I think she looks great except for those little areas. The naked lady in the barn took about 13 minutes. And that's just default G3...she's looking pretty good in that scene. All of these, except the warrior, were the same HDRI file. Is there anything I can tweak in my settings for IRAY to get rid of those fuzzy shadow areas? I did try that diffuse sample trick but I wasn't sure if that was applicable for IRAY or just 3Delight. I circled the areas I don't think rendered fully, BUT it could just be me. Or maybe it's the figure's shader? These are both skins from top quality vendors but they are Renderosity purchases. If anyone is still wondering if they should buy this...the answer is yes. I'd like to further point out that I have NO CLUE what I'm doing as far as IRAY and I've made a lot of nice pictures since getting this. All but the one that I'm asking about have rendered in under 30 minutes with very nice results. My system is not shabby, I have a nice NVIDIA card, but I have never been able to get IRAY to work before now. I know most people are looking at this for 3Delight and I can say it works great in speeding up those renders, but it's also great for IRAY especially if you were burned by it in the past. Render time for the 2400x3120 image was 9min24sec on a modest i5 with 32GB RAM and a 1060 with 6GB. DOF was achieved by loading a "squished" sphere primitive for the Lekkulion to live in (equivalent to a sphere with ground in Iray) and rendering out a Z depth pass used to create the DOF effect in post. The shader/script to apply it and squished world geo were borrowed from my NPR work. You may recognize the HDRI from the zombie image I posted earlier. I created the HDRI from the original stitiched 8-bit pano, which was 32,768x16,384 pixels. Regarding HDRI size: I've heard people say that nothing more than 8K is ever needed, but I disagree (although I do think this may be a functional limit before certain software really starts to choke). If you are shooting (rendering) zoomed in so your field of view is small, you are going to need a ton of pixels to render that small section of the full pano that appears in the background. Wish I had more time to play, but this is likely to be it for me until next year. Which reminds me, Happy New Year everybody! Have fun, and stay safe. Thank you so much. I am impressed by what I am seeing. My biggest gripe about UE is that it never seems to adequately render reflections or specular the way other light options can, and this looks like it can do that. Also excited about the new hdri options out there since I last checked (years ago). Of course now all those DAZ hdri products that have tempted me are even more tempting. Ok, I've climbed aboard and am playing in 3Delight, something I haven't done in a year and a half. Ooh, I'm rusty, but I've been coughing up a lung half the night and this is a nice distraction. So here's Keiko 6 in her basic clothing (wanted to see skin) in 3Delight with IBL Master. I used one of Fabiana's Theory of Zen HDRIs and just a tiny bit of Boost Light. Seems like too much, at least in this scene and on Keiko, blows things out. It's at 5%, and if I turn it up higher, her eyes get blown out. I'll have to play. I don't have hardly any 3Delight stuff downloaded onto my new computer yet. I'm sure I've got something that'll work with it. There is one pink spotlight set at 105 intensity on her as well. Can't quite get the lighting right yet, but it's a good start. I set the IBL Ground plane to be reflective using Marshian's reflective radiance shaders. (Should be interesting to see how that set plays with this one.) I love Fabi's reflective floors, as well as the UltraGenesis glass floor. Doesn't seem too hard to shade the ground plane to whatever you like here. Fabi's floor has a softer edge and could be reshaded as well. I set Gamma at 2.0. It looked washed out to me at 2.2 for some reason. Still seems too dark in some places, still tweaking. No postwork. Render time was 2 minutes! I'm loving that! EDIT: I don't think I actually had Gamma turned to "on." Sigh. So I've re-rendered with it turned on. Big difference! I still need to tweak some things. when using gamma 2.2 (2.20) 3DL textures and lighting will need adjusting. Proper quailty HDRIs should be good to go at 2.2 but many surfaces in 3DL will need the diffuse strength lowered and spec settings adjusted to offset the gamme correction. Normal lights will need to be lowered. This is all generally speaking. It all depends how the products was set up, for gamma 1 or 2.2. I think most 3dl products have been set for a gamma of 1. Thanks, kyoto kid. I know you render in 3DL, and believe this new product would be a game changer for you (or anybody who renders in 3DL for that matter). As anyone can plainly see in this thread, the support provided by @Parris is nothing short of phenomenal, too. Have no experience with Ansel, but I'll check it out - thanks for mentioning it, @outrider42. Thanks, Szark, that's good to know. Here's another test render, this time with a G8 that has 3Delight materials. I made sure Gamma was set to on and at 2.2. Haven't tweaked any surfaces yet. Used Orestes sunset as the HDRI and DA's Palm Island with the default loaded distant light still on (turned off the UE stuff though.) I added one pinkish spotlight at 50%. This rendered in 1 minute! Another Iray one here, same Old Steam-Driven machine as before. I love being able to see the HDRI background in the viewport while I'm putting things together, and I love how easy it is to have the light hitting everything just where I want it. This product releases every last bit of potential from HDRIs, a lot of which was lost or took forever to utilise when it couldn't be seen in the viewport in shader preview mode. You deserve every success with IBL Master, Parris. I put a shortcut to it up in my 'scripts' menu almost as soon as I got it, and I can't see why I'd ever want to work with HDRI's again without it. I tweaked my first image some more. Still not there, but better. I turned up the lights a little (boost and spotlight), put Keiko's skin at her SSS 75% setting, turned SSS on for her mouth and used Eye Reflection 1. I'd still like the get the skin and floor reflection looking better, but at least it's in the right direction. I upped Ray Tracing to 4 in order to see if that helped with the floor reflection but I don't see any difference. For some reason, this preview looks blurry in the eyes. It doesn't if you click and zoom in on the full pic. Now this is interesting and something I just never knew or thought of. I think I need a book on all of this just to get it. LOL I have done some playing, but I have been mostly reading this thread to see what I am missing or doing wrong while using IBL master. in short using gamma correction at 2.20 the surfaces supposed to react to light better and in my opinion this is true when you deal with the surfaces and lighting, adjusting to suit. This sounds a lot like Poser's Firefly...that might help me to understand 3DL a little better since I came to DS only just before Iray made it's appearance ;). Here is a test render, with the beach HDRs that were released the same day, too just 6 minutes and 30 seconds in Iray. Very happy with IBL Master, as it makes HDRs much easier to handle (no more multiples test renders just to check the hdr rotation and all), but still, I don't like these very sharp shadows HDRs are casting :/ (although the background and light itself are both very nice) , so I think I'll stick with the good old Sun/Sky mode when I can, you have full control on shadows softness with it (sun disk scale dial). @Szark Thanks, I will check that out. I didn't delve too deeply into 3Delight render settings before I switched over to Iray, so I need to do some reading. There may be some things to explore here in the IBLM Light, though it looks like it's just for 3Delight, not Iray? Not sure. It looks like you can control shading, shadows and other things but I need to read more. In fact, looking at that, I'm not sure it's supposed to be on for Iray renders, just 3Delight. Thank you for the tips , but yes, I think they are for the 3DL lights. I think the only way to alter these shadows in Iray would be to edit the hdr themselves, which isn't very handy (especially on special HDRs with dof like these, I would probably break something if I edit them myself). Happy New Year! And sorry, was trying to be helpful and ended up confusing myself. I'm blaming my stuffy head, LOL. Anyhow, I turned off the IBLM in my scene. I have no idea if having it on affected the render itself. It certainly changed the appearance of the viewport but I can't tell much difference from the previous render. First one here is with IBL Master and boost light on Zone 1 as Iray Disk, IBLM Light thingie turned off. Second is with added 3 point Fabiana lights set on low and a glow helper on the face. No problem :) , this is what I call the HDR dilemma anyway, and the reason why I always use Sun/sky whenever I can, the HDRs I've got that cast nice smooth shadows can't be used as backgrounds at all, and the ones with nice backgrounds do all have these harsh shadows... Seems you can't have both. Your renders are fine, there is more light into her eyes in the first one, I think :) .